Harley has faced every challenge even she could possibly imagine, but can she survive... a visit from her parents?! Harley's gang of misfits must be on their best behavior when the Quinzels come to Coney Island. Plus, Harley's entire cast of crazy characters comes together to celebrate the birthday of cyborg senior citizen Sy Borgman... but is there actually a bigger secret behind this gathering? 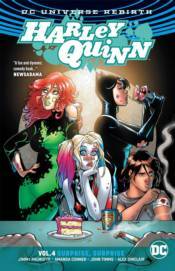 Collects the lead stories from issues #22-27 plus the HARLEY QUINN 25TH ANNIVERSARY SPECIAL #1!